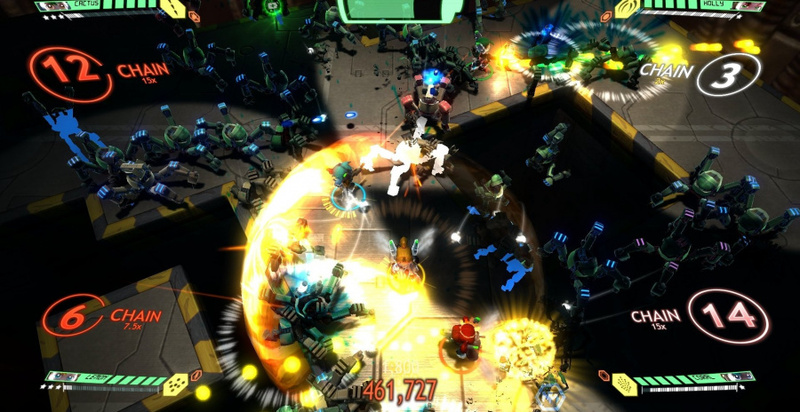 Assault Android Cactus is a name that may initially baffle, but once the game begins makes perfect sense; that's the case with this title as a whole. Bullet-hell shooters like this can look like confusing, terrifying propositions to the wrong audience, but once into the action anyone with quick thumbs will have a lot of fun. Those with slow reactions need not apply. Australian Developer Witch Beam seems to have taken much inspiration for this title from the Japanese market, where intensely challenging shooters are very much part of the landscape. Through the early access build now available on Steam, we took the chance to try out the PC version of the game, which is due to come to the Wii U in Q1 2014. The stages on offer in this build, which we should stress isn't the final product, are fairly plentiful, and give a taste of the design ideas that'll ultimately inform the full campaign. 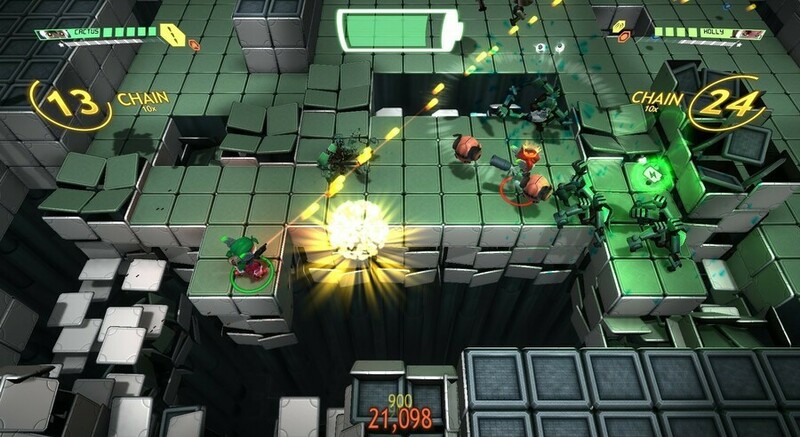 With an isometric top-down view point, this shooter feels perfectly suited to a dual-stick setup, though this version does support the keyboard and mouse while the Wii U version will include Wii Remote and Nunchuk controls. While we can understand the appeal of the quick precision offered by pointer controls, you're ultimately firing in a line — rather than aiming for individual foes — and due to the action often getting rather chaotic a Rambo-approach seems suitable. With most of the stages being arenas, focus on movement while blazing away is more the order of the day than precise gunning. Unlike on-rails shooters such as Sin and Punishment: Star Successor, therefore, the simplicity of stick aiming is ideal, as it was in Nano Assault Neo. Moving with the left stick, aiming with the right and firing with the right trigger shoulder button is simplicity itself, while you can mix it up with limited usage secondary weapons. In a tight spot, the half-second delay — which is very much deliberate — for your character to arm this weapon is one of the biggest judgement calls to be made; in the heat of battle, a blast of the powerful secondary may be the only escape. These secondary weapons are often limited to between one and three shots, yet recharge quickly enough that when you need them they'll likely be available again; a neat touch with multiple secondary weapons, such as rockets, is that going back shortly after using them often gives you one as opposed to the full three shots — this can be helpful in the toughest levels. Forming strategies around the weapons of each character is a major part of the challenge, too, and this build had five characters: Cactus, Holly, Lemon, Coral and Starch. These gun-toting female androids all have strengths and weaknesses, with some having weapons that are particularly useful on bosses, particularly, though we often settled on Holly or Lemon — their spread-gun and homing weapons don't have the sheer power of Coral's shotgun, for example, but provide excellent crowd control. To highlight how each weapon has clearly defined pros and cons, Holly's slow but powerful cannonball secondary is useless against a mobile boss, but terrific for firing into a mass of enemies; we would fire and literally follow its path of destruction to safety. As we've mentioned before, the stages on offer were typically arena based, with some being simple affairs and others gently mixing things up with moving floors or rotating walls. There are some flashes of diversity, however, with a rather fun side-scrolling stage, another that continuously loses light, and most notably the occasional transforming stage. Standouts include a descending lift, another where the floor dissolves and relocates frequently, and other where patterns of red walls appear and disappear, causing damage as they do. A few boss battles also made the cut to this early build, and they bring to mind much extended versions of equivalents in the aforementioned Nano Assault Neo. These foes have multiple stages, with their attacks becoming increasingly frenzied and desperate as each sequential life bar is drained away; one called Vespula controls a swarm of fly-like enemies, and is an undoubted highlight. All of the stages — bar one called Revolution, which was a bit of a difficulty spike that can, thankfully, be bypassed — pressure you to kill and clear quickly. You can die multiple times in a stage, but it's the time lost and weapon power-down that causes you to suffer, as you frantically tap the right trigger to get back into the action. A constant presence at the top of the screen is your "battery", which in basic arcade terms is your time limit. Some enjoyable power-ups — which allow super-speed, stronger weapons, shutting down enemy droids for a short spell and more — are dropped around the level, but it's the green batteries that are absolutely imperative. These give you a little more time, and often you'll be on the point of game over when one appears; dashing to retrieve it before it disappears, while dodging a couple of dozen enemies intent on destroying you, is delightfully madcap. The chaos and insanity that we refer to truly shines in local co-op, where the screen is flooded with enemies and keeping track is a challenge in itself. Single player is perhaps more structured and still a blast, but playing with a friend is where this one's true strengths may lie. Its final quality will undoubtedly also count on the final build maintaining the smooth 60FPS performance of the engine. We had the game running at full spec at 60 frames on our PC, and the visual style was colourful and, when in action, pleasing on the eyes. They're not graphics to blow any tech-heads, however, with primitive shadows in particular, but the art-style looks fantastic; we had no slow-down even when the screen was packed to the brim with enemies, and hopefully the final Wii U product will focus on that performance and keep faith in art-style trumping polygon counts. 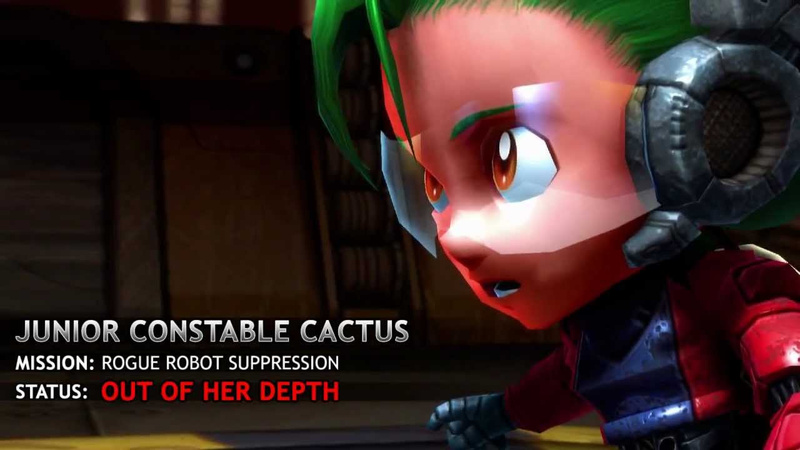 At this stage Assault Android Cactus is undoubtedly full of potential. In a couple of hours we'd cleared the available stages, some multiple times, and tried out all of the characters. With varied characters to cater to different play styles, bright visuals and rock-solid 60FPS gameplay, the solid foundations allowed the extravagant design to shine. We're left hoping that the final product has more creative stages with changing environments and less flat out arenas, and the Wii U version would benefit from co-op play that allows one to use the GamePad screen exclusively — the all-in-one camera occasionally had us struggling to follow where we were if our buddy was on the opposite side of the stage. We're certainly keen to see more of the campaign, while Boss Rush and Endless modes should be welcome extras. Fans of over-the-top bullet hell shooters should definitely take note of the unconventional name, however — Assault Android Cactus is worth watching. Our thanks to Witch Beam, which supplied an early-access Steam code for the purpose of this article. I will be keeping an eye on this for sure..
Can't wait. Hope its has a high score system that is online to compare w the world and friends. This is the kind of shooter I can get behind. This projected to arrive next year on eShop is that right? @iMii Yep, Q1 2014 is (I think) the target right now. Late 2013 is the PC goal for the final product, I believe. Suppressing rogue robots made me think of Bubblegum Crisis (anime), which I've been watching on Netflix in the US. Even if I don't have the reaction time to be good at it, this still looks like a fun game. I really, really enjoyed playing Geometry Wars: Galaxies on the Wii (though in that game the enemies swarm rather than shoot). But I still don't own a Wii U. Maybe one of these days. That isn't a bullet hell. It is an arena shooter (Same as Kokuga). I like it. Hope to see multi-player. Single and team leader boards. Different characters, skins, weapons. Random levels. Ooooh, this looks interesting. I'll give it a shot on WiiU when it releases...love me bullet-hell games, especially if there's 4-player couch co-op. It looks awesome! Can't wait to see how it looks and plays on my Wii U. Local co-op beats online any time! As long as leaderboards are online, the level of mandatory online is already reached for me. I'm even happy Rayman Legends kept its co-op local only. I just played the demo on steam and I've gotta say this game is a blast.